Sleepy Hollow and Bones to Crossover???!!! The fall's most confusing development, the upcoming two-hour Bones and Sleepy Hollow crossover event, will air Thursday, October 29 beginning 8pm on Fox, the network announced Thursday. In an episode that is said to "thrill the living, the dead, and everything in between," Booth (David Boreanaz) and Brennan (Emily Deschanel) will cross paths with Ichabod (Tom Mison) and Abbie (Nicole Beharie) after the discovery of some pretty grisly human remains. Naturally, they find that they're after the same evidence, because otherwise there is no single possible reason for these two crime-fighting teams to exist in the same universe, let alone team up for answers. 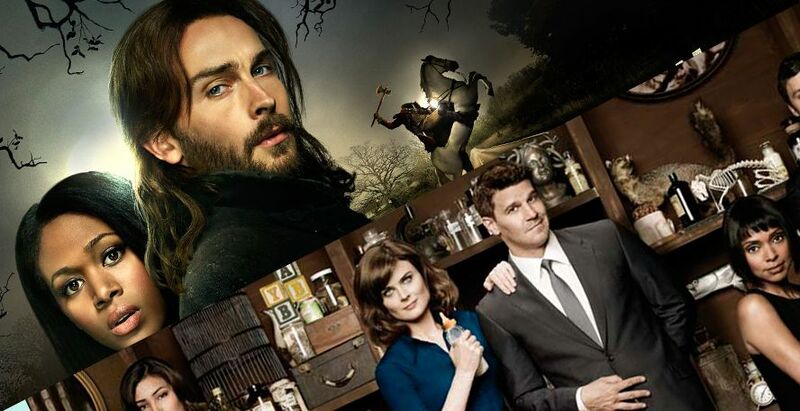 In the crossover's second hour, in a storyline that appears to be wholly unrelated to that of the first hour, Ichabod’s former nemesis—who is most definitely not the Headless Horseman (sad face emoji)—is back from the dead and Abbie and Ichabod seek out Booth and Brennan for advanced forensics to stop him. Because, sure, why not? Um can you say crazy? That is the oddest thing I've ever heard and yet I'm intrigued as a fan of both shows. I would have guessed that Bones and Sleepy Hollow existed in different "universes" but maybe not. But I have seen crossovers where in one show the case is supernatural and the other show they found a more logical explanation. Maybe this is how our Bones/Sleepy Hollow crossover will take place? I can't be sure but I plan on watching. What kind of show is Bones? I've never watched it. I love the idea of crossovers, though; I wish more shows did them. Bones is a crime drama which has been on for like 10 years. It is a great show but it would be similar to CSI or Law & Order I would think... well lighter than L&O. Sleepy Hollow is supernatural in nature and isn't even the same genre as Bones. Ah, interesting. Maybe I'll give an episode a try before Sleepy Hollow's crossover episode just to learn the characters. You definitely could do that but I don't know what you could glean from one episode. Most of the characters have been built up over the years but I say... episode one will tell you a lot about Booth and Bones (main characters). Well, this should definitely be interesting. I adore Sleepy Hollow, but have never watched Bones. oops, wrong show, wrong icon above. I hadn't watched Bones either and then went it started over on TNT I decided to get it a shot. So good. I love that show so much and now I'm forever hooked. But it isn't at all like Sleepy Hollow. Totally different genres. I've watched a couple episodes of Bones and it was pretty good. I guess there were just too many other shows I watch so I never got into it. That is why I didn't watch it originally and then I binged on it and got super hooked. But I'm quite baffled, because I can't see how a crossover would work between this two. I adore Bones too but I also love Sleepy Hollow but very different shows. VERY! I'm interested to see what they are going to do but it is still odd.